We have just received an exciting new gift set from Peapod Creations. 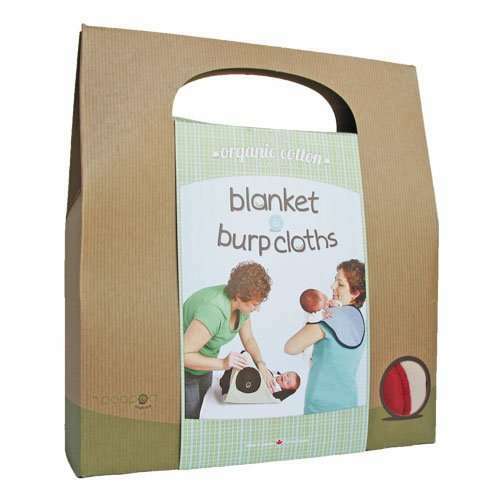 The set includes an ultra-soft baby blanket and two burp cloths. They are made from 100% organic cotton and what’s more they are made in Canada. The blanket has a small pocket for a soother or teether and the burp cloths are kidney shaped to fit beside the neck. They come in 4 different colour combinations and are reversible.The gift set is packaged in a recyclable cardboard carry bag and makes an ideal gift for a newborn or baby shower. This entry was posted in Baby Gifts and tagged baby gifts, baby shower gift, gifts. Oh my God! That is such a clean, cute, simple and sober site. And the blog too is very good. Very well done. I was tired of visiting long blogs with mostly useless stuff. I love the topic.